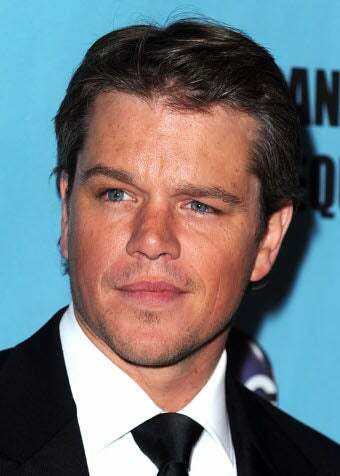 Those who didn't get a ticket to Nick's baby Oscars on Saturday had to make due with American Cinematheque's 24th Annual Award Presentation To Matt Damon at The Beverly Hilton. Luckily, it was pretty awesome. Sarah Silverman is a big fan of the perennially unflattering "Infanta skirt." Shawn Robinson rocks it in canary - a trying color. First of all, Marilyn from The Munsters called and she wants her hair back. Olivia Newton-John in Xanadu would claim the frock, but that would be indecent, and she's nice. Actress Patty McCormack does classic mother-of-the-bride chic, with a touch of Monet palette. Olivia Wilde, in awkward-length disco-slink. Producer Paula Wagner and the Horizontal Lines. I kinda like that Joanna Kaye (with Paul Greengrass) is bringing the Frederick's of Hollywood element. To paraphrase Cosmo Brown, it's a Hollywood law. Paris Hilton ripping off Mattel is one thing. Stacy Keibler ripping off Paris Hilton ripping off Mattel is quite another!